Take a moment and think about how many hours during the day you spend on your phone? More importantly, think about how many hours per day your child spends on their phone? Our phones nowadays are used for everything. With countless apps and social media, it truly has become a revolutionary on-the-go tool. So, being glued to our phones is not at all a surprise in this day and age. However, have you considered the impacts of too much screen time on your health? 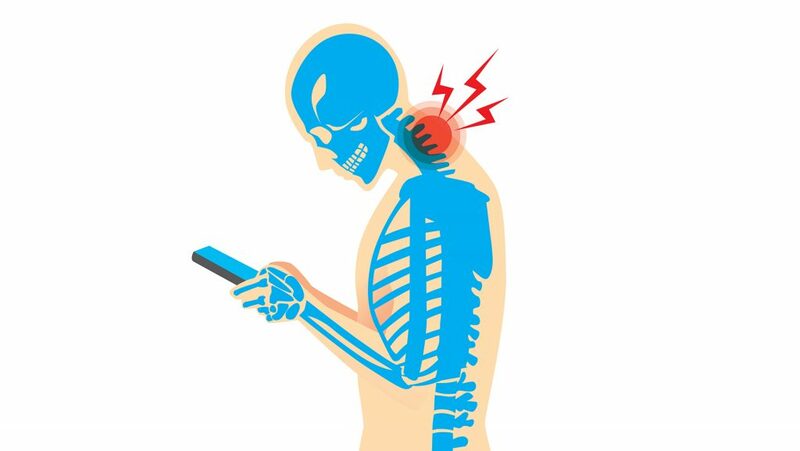 Here is one important aspect – too much screen time is leading to increased strain on our necks. This 21-century problem is becoming so prevalent that the term “Text Neck” is now being used to describe it. In addition to Smartphone’s you can add hand held gaming devices, computers and other electronics. Observe your child this week as they are on their Smartphone or other electronic device and you should notice that their neck is in a forward or flexed position. Naturally, this constant position throughout the duration of the day puts a lot of stress on the cervical spine, specifically in the loss of the normal cervical curve or C-curve. A loss in C-curve used to be predominantly seen in older adults after years of certain repetitive activities and would be accompanied with arthritis. But due to the increasing use of smartphones and always looking down when texting this is becoming an issue for young adults, and children. Why is it important to get your posture checked? Because this repetitive flexed position will eventually start to wear down the cervical discs and spinal vertebrae, causing osteoarthritis and potentially countless other issues. Osteoarthritis (At such a young age) will lead to joint pain, stiffness, and overall increased stress on important nerves in our body. Don’t ignore the underlying cause of Text Neck. We at the Oakville Chiropractic Centre offer Spinal Screenings and Postural Evaluations for you and your child in order to determine whether you and/or your child are starting to fall in the bad posture habits of Text Neck. Our knowledgeable doctors can also give you exercises to take home in order to stretch and strengthen the muscles you aren’t using when in that flexed position. taking frequent breaks if they are on their devices for long periods of time. Call us at 905-845-2291 or email us at info@oakvillechiropractic.com to arrange an evaluation for you and your family.